Dill…..a miraculous herb that spells the charm of lull and pulls you out of illness. 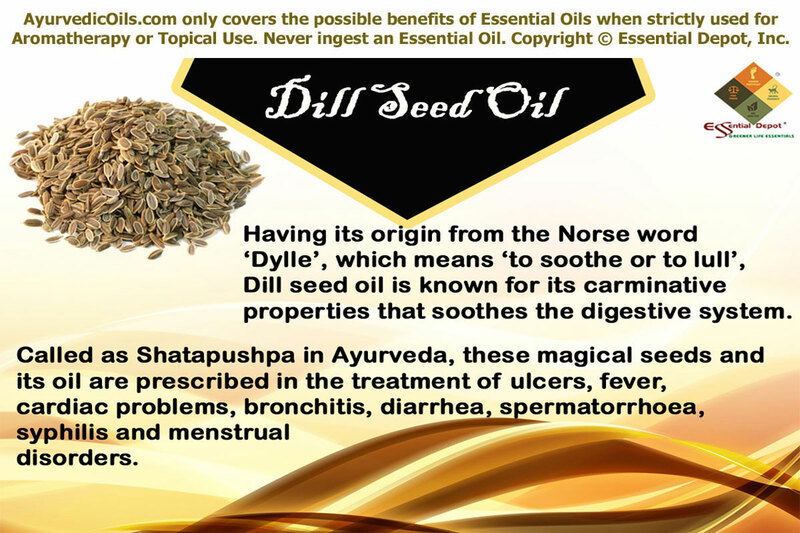 Having its origin from the Norse word ‘Dylle’, which means ‘to soothe or to lull’, Dill seed oil is well known for its carminative properties that soothes the digestive system and is used in Ayurveda for the treatment of ulcers, fever, cardiac problems, bronchitis, spermatorrhoea, syphilis and menstrual disorders. Called as Shatapushpa in Ayurveda, Dill seeds are one among the most promising culinary herbs used in the Indian tradition especially during childbirth. Botanically known as Anethum sowa, Dill seed essential oil is extracted from the dried seeds by steam distillation method. These magical little seeds and its essential oil are prescribed in Ayurvedic healing for treating dysentery, menses, diarrhea, inflammation and for mental disturbances. Native to the Mediterranean and Black Sea regions, Dill has been used worldwide as an aromatic spice and a healing herb. Ancient Greeks and Romans considered it as a sign of health and wealth and carried the twig of this herb in the belief that it would protect them from curses. Few sources state that a lot of superstitions prevailed in the medieval period that Dill was used to prepare potions for casting spells and protecting one from the ill effects of witchcraft and evil spirits. Hippocrates, the Father of Medicine used Dill seeds in his medications for oral cleansing. Ancient warriors applied the extract from Dill seeds and twigs onto burns for quick healing. Dill seeds have exclusive carminative properties. It is for this reason that Emperor Charles the Great ordered the presence of Dill on his banquet tables to benefit his guests who indulged too much. The entire plant of Dill including the seeds, leaves and twigs are equally important and carry the same flavor and aroma. The well known antimicrobial properties of this herb compel the use of Dill seeds in this planet for the preservation of food and in the preparation of pickles. Easily available to common man, Dill seeds are an aboriginal remedy for curing insomnia, cold, fever, respiratory illnesses, diarrhea, dysentery, flatulence and a recent study has proved that it helps in preventing cancer. The proportion of the chemical constituents for all essential oils mainly depends upon the topography, seasons and various other attributes of its nativity. Dill is cultivated all over the world for its valuable benefits. Results of various researches state that Dill seed oil contains carvone, d-limonene, α-phellandrene, dihydrocarvone, eugenol, β-phellandrene, α-pinene, anethole, dillapiole, myristicin, carveol, arginine, β-caryophyllene, apiole, and others. Antimicrobial, antispasmodic, anti-inflammatory, antihistamine, antioxidant, carminative, digestive, disinfectant, anti-hyperlipidaemic, anti-hypercholesterolaemic, anti-fungal, aromatic, diuretic, galactogogue, sedative, stomachic and sudorific are some of the priceless therapeutic properties of this prized oil. Dill seeds and few other extracts from this plant including its essential oil is administered to people of all ages in Ayurveda, depending upon their nature of illnesses. Ayurveda means the ‘knowledge of life’ and it aims at longevity through prevention of diseases along with its healing. This ancient wisdom analyzes the root cause of an illness and progresses towards treating the root cause instead of the symptoms alone. Ayurvedic philosophy states that nature is made up of five vital elements known as water, earth, fire, space and air. It also says that everything on earth is a part of nature so all these things are also made up of these five elements. Each element represent various parts of the human system, where earth represents muscles and bones, water represents blood and other fluids, air keeps us breathing, fire is the internal force created for movements and various functions of the body and space or the cosmic energy is the soul or spirit dwelling within us. Human body is considered as a temple in Ayurveda where the spirit lives in and Ayurveda recommends one to keep his mind and body clean and tidy just like a temple for leading a healthy and harmonious life. Every individual is unique in terms of Ayurveda and this individuality is identified with the distinctive individual constitution comprising of three biological energies known as doshas, namely kapha, pitta and vata. Vata is responsible for movement, nervous functions, blood circulation, creativity and transmission of air and other vital elements. Pitta energy deals with metabolic functions, decision making skills and body temperature. Kapha dosha takes care of structure, movement of fluids, love and sustenance. Balance between these doshas indicates healthiness and imbalance causes illness. Ayurvedic remedies like yoga, herbs, meditation, essential oils, physical exercises, Abhyanga and Ayurvedic routine focus on striking absolute balance between these doshas. Dill seeds have a unique aroma that simply adds up to the flavor of various cuisines. It is one among the primary herbs in a number of kitchens across the globe including Europe, Asia and the Middle East. Also known as Lao Coriander it is often used in pickles and in fish dishes due to the high concentration of carvone which is antimicrobial in nature. As an aromatic compound, it possesses anti-microbial, anti-fungal and anti-bacterial properties that help in preserving the edible items for a long time. As a natural reducing agent of blood glycerides, Dill seeds have gained popularity as one of the most flavored and healthiest herbs of the Middle East. Most of the European countries, especially Germany uses Dill seed oil to preserve cucumbers and pickles, affordable to poor people as well. A variety of dishes like soups, sauces, salads, pickles, vinegars, fish and rice become special with the touch of this enticing herb. It is also used in confectionery, cakes, bread and apple pie. Dill seed oil is a good source of calcium, dietary fiber, manganese, iron and magnesium. The presence of arginine strengthens bones, teeth and helps in the prevention of bone loss that occurs after menopause and even after some severe problems like rheumatoid arthritis. Few reliable sources even state that Dill seed oil is effective for treating hiccups due to its high calcium content. Skin is the largest organ of the body and any medications used on the skin easily penetrates through the skin. The therapeutic properties of Dill seed essential oil when used topically, enters the skin and reaches the blood stream and heals the system naturally. The best way to acquire the calcium and other energy nutrients of Dill seed oil is to add 3 drops of this oil to bathing water and massage your body with 6 drops of Dill oil blended with 3 ml of olive oil. This assists in supplying the essential calcium, iron, fiber, magnesium and other nutrients to the body. β-phellandrene, α-pinene and other constituents of Dill seed oil attribute to the carminative property of the oil that helps in preventing the formation of gas in your intestines as well as aid in the expulsion of gas. It helps in the secretion of bile, a fluid produced by liver that aids in digestion. Dill seed oil is also stomachic in nature and assists in curing stomach pains that occur during menstrual cycles. It fights against flatulence, constipation, hiccups and colic in infants. As an exclusive antimicrobial, antispasmodic and antifungal oil, Dill seed essential oil is recommended for treating dysentery, diarrhea and food poisoning. It fights against infectious microbes, soothes the digestive system and protects from infections and indigestion. A recent research on ‘Seasonal differences in essential oil composition on Dill seed oil and Parsley oil’ has proven that the antimicrobial compounds like α-pinene, cineole and limonene in Dill seed oil have been proved effective against food-borne pathogens like Staphylococcus aureus, Bacillus cereus, Escherichia coli, and Campylobacter jejun. Dill seed oil fights best against the microbes Aspergillus niger and the yeasts Saccharomyces cerevisiae and Candida albicans. Mix 2 drops of Dill oil with 1 ml of sesame oil and gently massage on the stomach and abdomen for treating dysentery, diarrhea, flatulence, hiccups and constipation. In case of infant use, blend 1 drop of Dill oil with 2 ml of sesame oil and massage it gently on their tummy in slow circular movements. You can also add 1 to 2 drops of Dill oil in warm bathing water or in diffuser for relieving from digestive disorders. Dill seed oil is rich in monoterpenes, which activate the secretion of the enzyme glutathione-S-transferase. This enzyme helps in putting together the anti-oxidant molecule glutathione to the oxidized ones thus helping in prevention of cancer. It is also an excellent neutralizing agent of carcinogenic substances like benzopyrenes found in cigarette smoke, charcoal grill smoke, and the smoke produced by trash incinerators. The anti-oxidant property of Dill seed oil is applied in treating mimic wrinkles around the eyes since it fights against free radicals responsible for various symptoms of aging including wrinkles. Mix 2 drops of Dill seed oil with 1 ml of Jojoba oil or with your regular skin care cream or lotion and gently apply it on your face and other wrinkles prone area for visible results. This massage aids in refreshing and soothing the skin surface. A recent study on Dill seeds have been proved to possess antihyperlipidaemic and antihypercholesterolaemic effects. It fights against hyperlipidemia that describes a condition of elevated levels of lipid formation and hyper cholesterol, which is nothing but increased cholesterol level in the body. Maintaining the level of the fat soluble molecules called lipids and cholesterol in healthy standards yields fitness at all ages especially when you grow older. Massage your body with 6 drops of Dill essential oil blended with 3 ml of coconut oil, followed by hot bath where 2 drops of Dill oil is added to bathing water as well. This aids in decreasing the level of cholesterol and enables to feel light and fit. The soothing, calming and refreshing effects of flavonoids and group B vitamins in Dill seed oil helps in regulating the secretion of hormones and enzymes in our body that pacifies the nervous system. It is generally recommended for people suffering from insomnia and nervous disorders. Placing cold to warm bags immersed in water with Dill seeds allowed to soak for few minutes, on closed eyelids will help you in experiencing a calming effect. You can also add 2 drops of Dill oil every night in your diffuser, burner or vaporizer for promoting peaceful sleep throughout the night. Dill seed oil fights against inflammation and allergies. People with oral inflammation in the throat and mouth are administered with this oil. Monoterpenes and flavonoids help in cleansing the respiratory system in case of allergies. Add 2 drops of Dill oil in steam inhalation and inhaling this medicated aroma helps in alleviating respiratory infections and allergies. Aggravated kapha dosha is responsible for causing inflammation due to excess water deposits, salt, uric acid and other toxic substances in the system. Dill essential oil has the efficiency to reduce increased kapha dosha and its anti-histamine properties helps one in getting rid of inflammation and other infections associated with it. Massage the inflamed and painful parts with 2 drops of Dill oil mixed with 1 ml olive oil for lessening pain, swelling and inflammation. Since Dill seed oil is rich in antimicrobial, anti-fungal and antibacterial properties it acts as a disinfectant and helps in killing the disease causing germs and micro organisms. This oil also acts as a mouth freshener by killing the microbes and fighting against the free radicals that affect the gums and teeth with its antioxidant effects. Add 1 drop of Dill oil in a cup of warm water and use it as a mouthwash for battling against harmful microbes causing oral infections. Bacteria, fungus, virus and other micro organisms are the root cause of many diseases. Dill seed oil protects you against these infections and is a valuable remedy for cold, cough, flu, fever, bronchitis, spasms, respiratory tract diseases and healing wounds. The diuretic property of this oil assists in treating urinary infections and regulates the excretion of urine without any difficulties. Since it induces the secretion of certain enzymes and hormones, Dill seed oil is used to regulate the menstrual cycle, increase the quantity of breast milk, and prevent early ovulation by acting as a natural contraceptive. Dill seed oil is also used in perfumery and cosmetic industries. This article is only for the purpose of education and is not intended to diagnose or replace any prescribed medicines or professional medical advice. Always use essential oils externally in a diluted form, as pure and organic essential oils are highly concentrated substances and can cause adverse effects if used directly on the skin. Never ingest essential oils unless it is recommended safe by your medical expert. Remember to consult your Ayurvedic practitioner before choosing the right essential oil for your unique individual constitution and health condition. Composition, quality control, and antimicrobial activity of the essential oil of long-time stored dill (Anethum graveolens L.) seeds by PubMed. 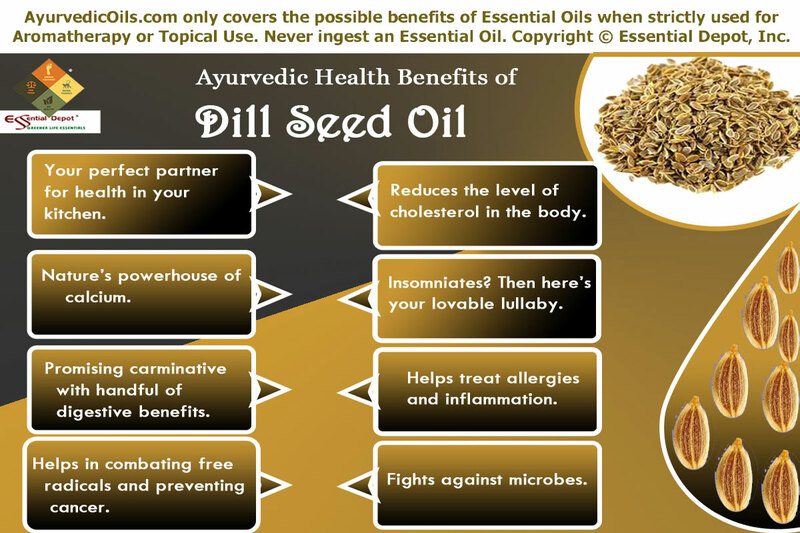 This entry was posted in Essential Oils - Learn About and Purchase and tagged Anethum sowa, Ayurvedic health benefits of Dill seed oil, Ayurvedic oils for calcium deficiency, Ayurvedic oils for dysentery, Ayurvedic oils for flatulence, Ayurvedic oils for indigestion, Ayurvedic oils for infants, Ayurvedic oils for inflammation, Ayurvedic oils for insomnia, Ayurvedic oils for menstrual pain, Ayurvedic oils for microbial infections, Ayurvedic oils for nervous problems, Ayurvedic oils for preventing cancer, Ayurvedic oils for reducing cholesterol, Ayurvedic oils for wrinkles, Dill seed oil in Ayurveda, Health benefits of Dill seed oil by AyurvedicOils. Bookmark the permalink.